Yvette was born on a country estate and grew up gathering blackberries, nuts and wild garlic. Community has been important to Yvette from childhood when in Scotland she exchanged eggs with the trawlers for fresh fish and from these years has developed a passion for the land and its food. Yvette worked in horticulture for 16 years gaining extensive plant knowledge and associations with food. She opened an award-winning organic farm shop with cafe and deli before launching Harts Barn Cookery School. She has a keen interest in researching heritage recipes. Yvette also provides care and tuition to those with special needs both within the cookery school and her continued work outside. 1. What is your favourite food? Rice. 2. What do you love about teaching at Harts Barn Cookery School? Watching people gain confidence and leave smiling. 3. What are your ‘outside’ interests? Fund-raising and my dog, Bertie. 4. What is your top cooking tip? Don’t struggle to peel fresh squash – pop in the oven for 15 mins and it becomes easy to peel and chop or just leave the skin on. 5. Please tell us something not many people know about you. I sold plants to No 10 Downing Street. Versha’s childhood was immersed in traditional Indian culture and cuisine. From the age of 8 she helped her mother cook a multitude of dishes for family and friends. 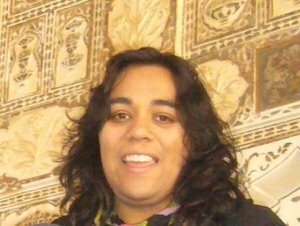 30 years on, she now teaches Indian cooking, showing that Indian cuisine doesn’t have to be daunting. Using simple and effective techniques, she breaks down the process into understandable steps, and reveals the secrets to making mouthwatering Indian foods. After spending several years travelling around the USA, Versha now lives with her family in Cheltenham. 2. What I love about teaching my class at Harts Barn Cookery School. The beautiful views and everybody booked on the a course is always eager to learn. 3. What are your ‘outside’ interests? Growing vegetables in my allotment. 4. What is your top cooking tip? Always taste your food. Everyone’s palate is different. 5. Please tell us something not many people know about you. I practice Kung Fu. Erin was born and bred in a small rural town in New Hampshire and has been teaching since 2002. Not always in the kitchen, whether working in a community allotment or catering an event, delicious, healthy recipes never fail to inspire new ways of thinking about food and the way we eat day to day. She combines local seasonal vegetables with world flavour and lives up to her sir name, Baker. She is an avid fruit and vegetable gardener with a passion for edible flowers. Prior to living in the UK, Erin was co-owner of an award-winning vegetarian restaurant in California. 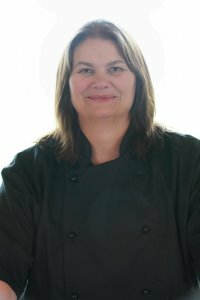 She currently resides in Stroud and runs the Natural Cookery School, teaching at cookery schools, private parties and catering throughout Gloucestershire and further afield. 2. What I love about teaching my class at Harts Barn Cookery School. The setting, nestled in the Forest of Dean surrounded by countryside, a bucolic place to teach! 4. What is your top cooking tip? You can always add, but you can never take away! 5. Please tell us something not many people know about you. I learned how to swim before I learned how to walk. As well as tutoring at Harts Barn Cookery School, Barney puts on regular supper clubs and home dinner parties as Infamous Catering and works at Cameron’s Game, Fish & Butchery in the Forest of Dean. His passion? Creating accessible,exciting fusion food, using the finest British ingredients combined with the flavors of his wanderings. Encouraging people to think about the welfare, sustainability and amount of meat they eat. 1. What is your favourite food? Currently (and it changes regularly) Home made Burritos with all the trimmings. 2. What I love about teaching my class at Harts Barn Cookery School. Having Fun with people who, like me, care about real food. 4. What is your top cooking tip? Experiment. Try- Fail, Try again- Fail Better. 5. Please tell us something not many people know about you. After 42 years I just found out I like Cats. As one of eleven children I had an early decision to make: either help with the washing up or the cooking. I chose cooking! From there I went into teaching, eventually becoming head of a bakery school and later head of catering at a college in Gloucestershire. I having also been a publican and restaurateur and have gained a range of knowledge and skills in all parts of the food industry. Now teaching at Harts Barn Cookery School, I believe that good baking and cooking comes from knowing your ingredients and how they work. Recipes are guides and should be used in conjunction with your knowledge of how ingredients vary from season to season. I have three young children: 9-year-old twins and a 6 year old and all have a love of cooking and baking. Les Rennie has been fortunate to work in some exceptional Michelin star kitchens in the UK throughout his career having also had the pleasure of working with some of the most fearsome chefs in the industry where he developed a love and obsession for doing things the right way with flair and imagination. This led to him taking on his first ex chef role and winning his first Michelin star (to name only one) at the Relais and Chateaux property Ynyshir Hall in West Wales back in 2002. Les has trained and watched in earnest over the years at some of the chefs he helped train move onto winning their own stars. He has a passion for training and giving his knowledge to the next generation of “young wannabe” cooks and his love of all things food. 1. What is your favourite food? I love all food and couldn’t possibly list just one. 3. What are your ‘outside’ interests? The garden – I seem to have developed a love for growing my own – the taste is far superior. 4. What is your top cooking tip? Cling film… If you have been on one of my courses you will understand. 5. Please tell us something not many people know about you? I was the only boy at school in a class of 30 girls that did cooking – and the teacher said “one boy is more that enough”! Funny how times change.